While genetics definitely plays a significant role in your skin’s strength and elasticity, you are not locked into a future of sagging skin! 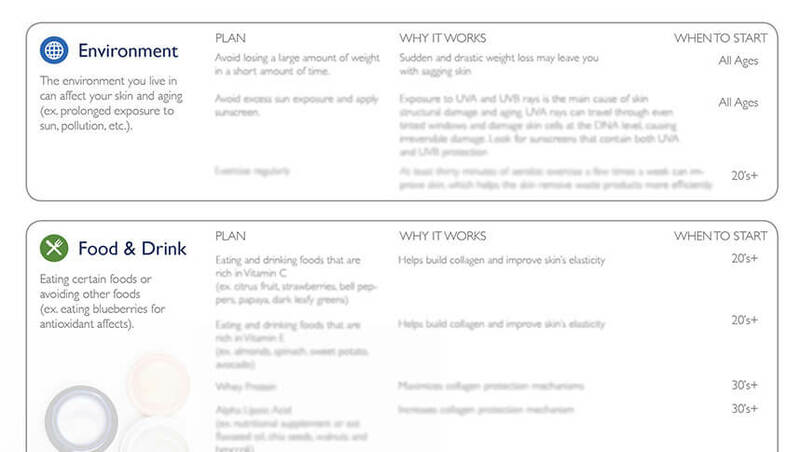 Here are some steps to take now in order to maintain and even restore your skin’s elasticity. Enjoy foods with Alpha Lipoic Acid like flaxseed oil, chia seeds, walnuts and broccoli which all contain the fatty acid chain that boosts your skin’s elasticity powers. Water nourishes our cells and keeps skin from looking dry and dull. Skincare products with active ingredients such as Vitamin C, Vitamin E, Glycolic acid, Coenzyme Q10, Retinol .3% and Resveratrol are designed to promote collagen production. Look for sunscreens that contain both UVA and UVB protection, especially if you are predisposed to sun-sensitive skin. The sun breaks down collagen, our skin’s cellular structure, and causes irreversible damage. It is never too late to protect your skin! 5. Talk to a professional. How Do You Know Which of These Tips are Right For You? These tips can help to improve your skin’s elasticity, however, how do you know which are right for your skin? There is no one-size-fits-all approach to skin care. In fact, your skin’s secrets are locked in your DNA. Genetics account for approximately 60% of skin properties. Eliminate guesswork with an easy to use at-home genetic test. The Viazoi Skin Beauty genetic insights kit will give you important information about your skin and the skincare products with the most effective active ingredients for your needs. You will finally be able to decide what is right for your skin, and what tips and advice to begin listening to. 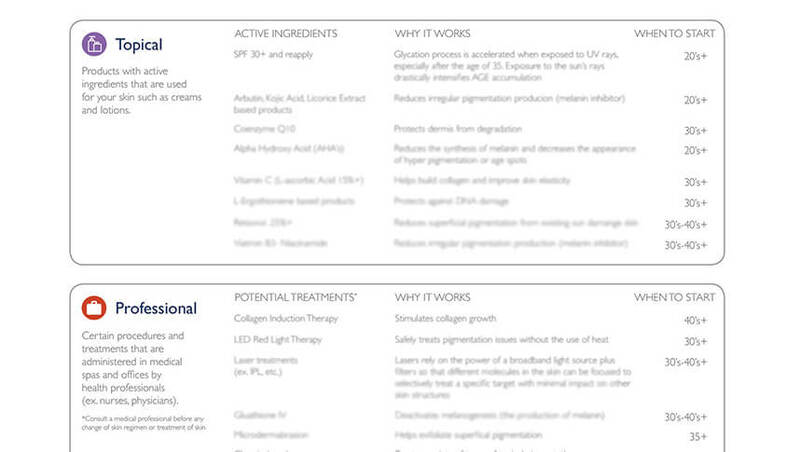 that best fit your lifestyle to achieve optimal long-term better skin health. Our Skin Beauty kit will give you the information to choose the right skincare products that match your unique skin biology. No matter your age, it is never too late to begin nurturing your skin for long-term radiance. expected rate of collagen breakdown. Are you prone to sunspots? foods to eat and professional “treatments” you may want to consider. See excerpts from the report below. collection kit directly to your home. to discuss options for professional care. What Do I Do with the Test Results? How is this different from other forms of skin tests? 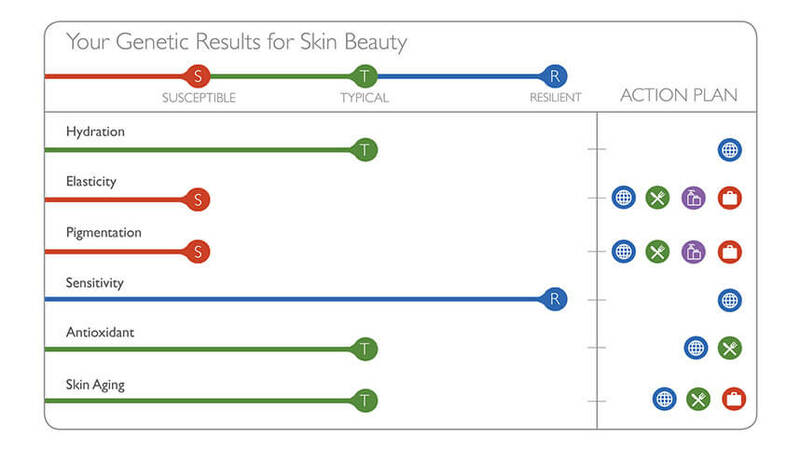 The ability to predict skin type based on your DNA is crucial to understand how to better manage to achieve a healthy skin. 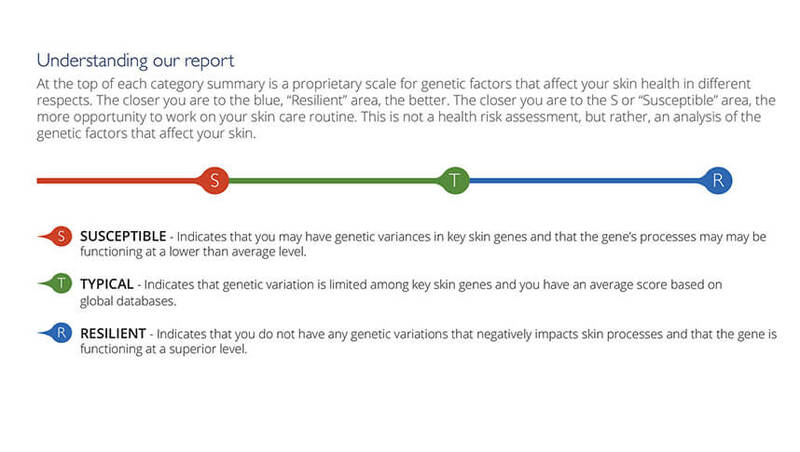 Only a genetic test can give you the required analysis of your skin. 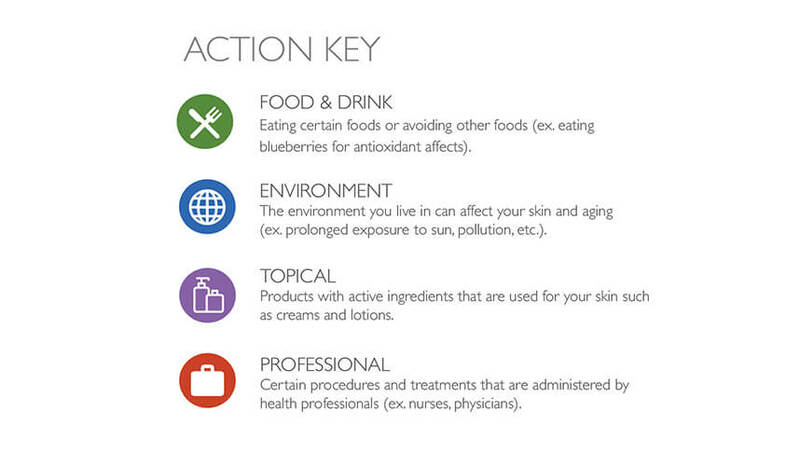 Your report is the only report that will list the active ingredients you should look for in products that will be the most effective for your skin. 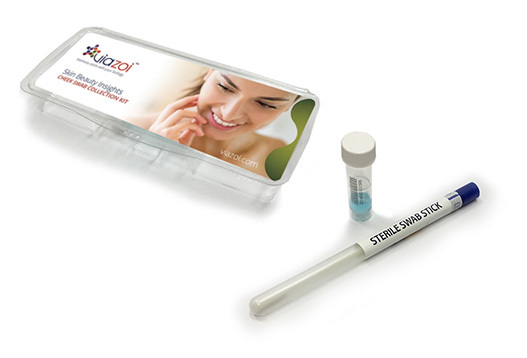 Purchase your test and we will ship the collection kit directly to your home. Provide sample using the collection kit and ship back using the included prepaid packaging. After you receive your custom report, use information as you shop for skin care products or visit your dermatologist to discuss options for professional care. I have a great skin, do I still need to take this test? Yes, you do. 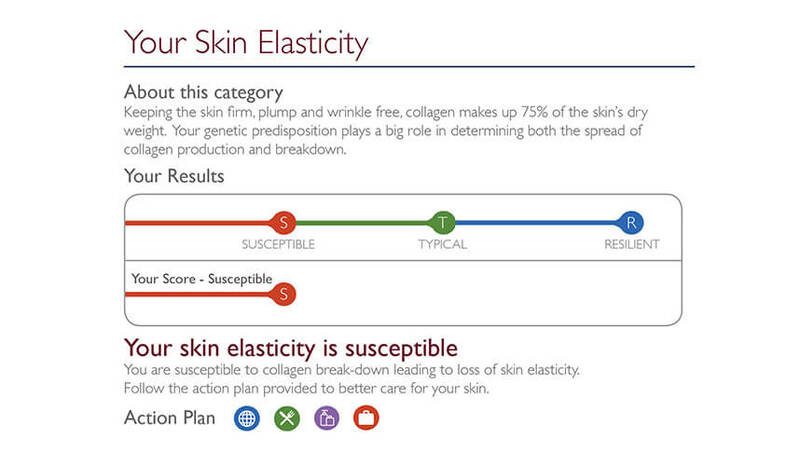 Understanding your skin’s genetic factors can help you achieve long-lasting results. A healthy skin is more than just choosing the right cream based upon whether your skin is oily or dry. Who will see my results? Results are available to you, as well as any additional family or friends that you choose to share the results with. The results are available online in a printable pdf format. Will this test give me medical advice or be a diagnosis of any kind? No, this test is for educational purposes only and subject to change. This test and report does not provide medical advice, diagnosis or treatment recommendations for any diseases. You should always consult with your physician if you have questions about health issues with your skin. FDA approval is not currently required for use of this test. This test was developed and its performance characteristics were determined in a CLIA-certified lab. Order My Skin Testing Kit Today!